Black Panther wins Best Picture and becomes the new leader in the race for Oscar Best Picture. Amazing. Quite a feat and well done! UPDATE Rami Malek wins Best Actor for playing Freddie Mercury in “Bohemian Rhapsody.” He’s suddenly leading the pack. He also won the Golden Globe. Will he win the Oscar? 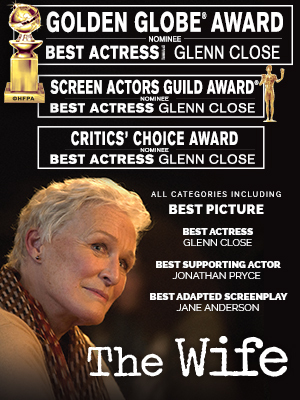 Glenn Close wins. She’s getting that Oscar. IN THE PAST, the SAG Awards were a pretty indicator of the Oscars. This was mostly because the actors in SAG would vote the same way twice. Best Ensemble pointed to Best Picture. But this year, SAG voters didn’t include “Green Book” or “If Beale Street Could Talk” in what is now called Outstanding Performance by a Cast. “The Favourite” is also missing. SAG chose very commercial films. Really, “Crazy Rich Asians” is fun but shouldn’t be here. Maybe new SAG voters don’t understand what the category is. So the winner tonight is not necessarily the Oscar winner. But the actors are likely the Oscar finalists. That’s the way it went last year. But “3 Billboards” lost the Oscar to “The Shape of Water.” Two years ago, Denzel Washington won Best Actor for “Fences” and lost the Oscar to Casey Affleck in “Manchester by the Sea.” “Hidden Figures” won the cast award. “Moonlight” won the Oscar. So far, Emily Blunt is a nice surprise as winner of Best Supporting Actress in “A Quiet Place.” Tough category. SAG didn’t even nominate Regina King, an odds an winner for the Oscar. Alan Alda received the Lifetime Achievement Award. Sandra Oh and Jason Bateman won Best Actress and Actor in a Drama. Patricia Arquette won Best Actress in A Mini Series. Darren Criss won Best Actor in a Mini Series.